Brown Thornbill – Careel Creek January 12th, 2013. The Brown Thornbill (Acanthiza pusilla) is a passerine bird usually found in eastern and south-eastern Australia, including Tasmania. It can grow up to 10 cm long, and feeds on insects but may sometimes eat seeds, nectar or fruit. They feed, mainly in pairs, at all levels from the ground up, but mostly in understorey shrubs and low trees. Will feed in mixed flocks with other thornbills out of breeding season. Breeding pairs of Brown Thornbills hold territories all year round for feeding and breeding purposes, and the bonds between pairs are long-lasting. Their breeding season last from July to January. Females build a small oval, domed nest with a partially hooded entrance near the top out of grasses, bark and other materials, lining it with feathers, fur or soft plant down. The nest is usually low down, in low, prickly bushes, grass clumps, or ferns. The female incubates the eggs, usually 2-4, and both parents feed the young, who stay with the parents until early autumn, before being driven out of the parental territory. 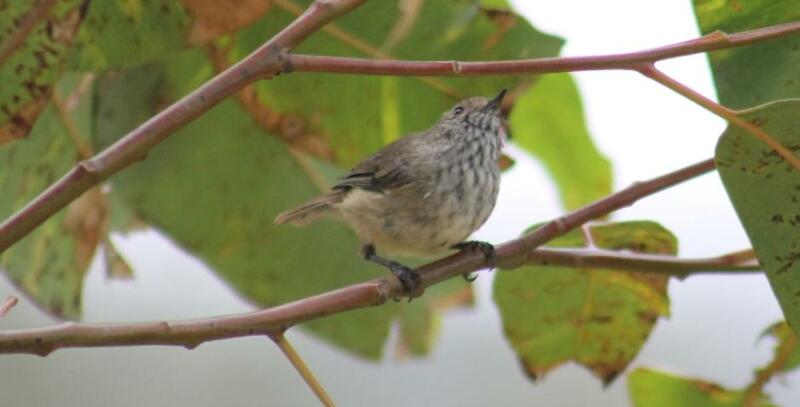 Did you know the Brown Thornbill will respond to humans imitating its calls. Its own calls are rich, musical warbles and accomplished mimicry. This one, along with a few others, were seen in the new eucalypts planted by our Bushcare people alongside Careel Creek just behind the sand dunes of Avalon at the northern end. Identified with thanks to Marita Macrae of PNHA. If you want to see more birds, accompanied by people who know what they’re talking about, Pittwater Council is offering and Eco Bird Walk on February 16th 2013. Details below but be sure to get in quick, numbers are always limited for these walks and places fill fast. A relaxing morning discovering unique birds of Warriewood Wetlands. Join us on a guided walk through Warriewood Wetlands, the largest remaining sand plain wetland in northern Sydney made up almost entirely of endangered ecological communities. The wetland is of regional conservation significance and is highly valued by the local community. It also provides very important habitat for a number of threatened species and migratory birds. Local bird enthusiasts will assist you in discovering and identifying the native bird species and local flora and fauna of the amazing natural environment of the Warriewood Wetlands. Pictures by A J Guesdon, 2013. All Rights Reserved.